In the mega-nautical field we are even more familiarizing with tenders lapping sometimes extravagancy today, and the market offers more and more objects which seem to turn to pure pleasure when being used for relax; at the same time they show up to be useful and sometimes non replaceable at all. One of these at first sight eccentric proposals is the SLC K200 carbon micro car able to. be parked on the flybridge of a yacht too! 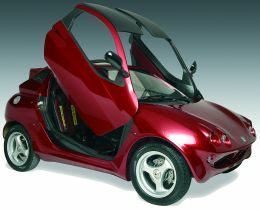 It's about a very high - tech mean designed by the Italian Super Light Cars - ATR Group - and realized with advanced composite materials making for weight - saving, because this micro car is intended mostly to be used as a yacht tender. The K200 was first introduced at the recent SEATEC Show, the nautical sub-furniture show taking place every year in Carrara (Italy), where this carbon micro car aroused lots visitor's interest right in its building material features whose developing is the Super Light Cars group's top - peculiarity. Other K200's characteristic features are sporty sleek lines and design tricks like a steering sequential gear and "elytra" opening doors, commonly used in building bigger means. By using carbon fibres the Italian SLC has achieved a lightweight, rigid, torque resistant structure that make the K200 a very strong auto tender; moreover, frame and mechanical features can ensure both high road holding and fatigue strength. The K200 design has been conceived, developed and survived by the same in - house team that had taken care in realizing body and chassis of cars like "Enzo Ferrari", Porsche Carrera Gt or Maserati MC12. This is a very original tender design that let an owner have an auto tender useable in harbour, and as easy to be hauled up as a pram or an aqua - scooter is.